How would you like your eggs? The age old question asked millions of times each year. If your answer is scrambled, then you will be disappointed with this post. If you are looking for a simple way to prepare poached eggs that does not require boiling any water, then these Instant Pot Poached Eggs are for you! 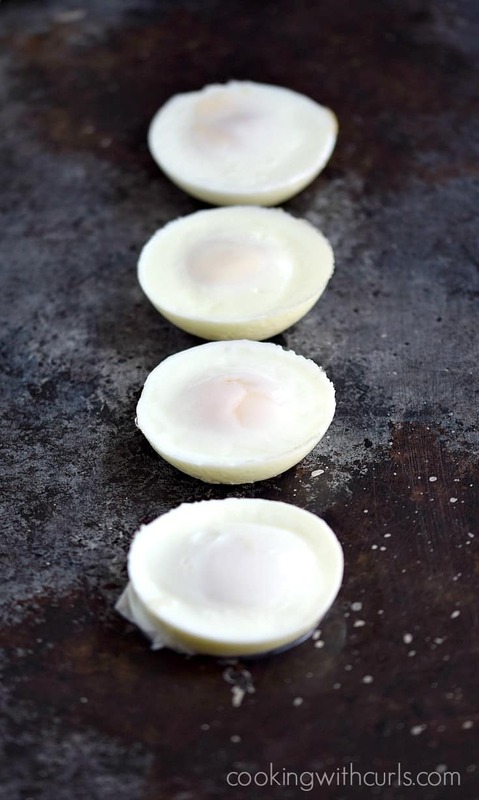 Now you can have poached eggs cooked exactly the way you like them in 2, 3, 4, or 5 minutes…..
Place the trivet that came with your Instant Pot in the bottom of the liner and pour in 1 cup of water. Spray each silicone cup with Pam cooking spray or rub with ghee/butter. 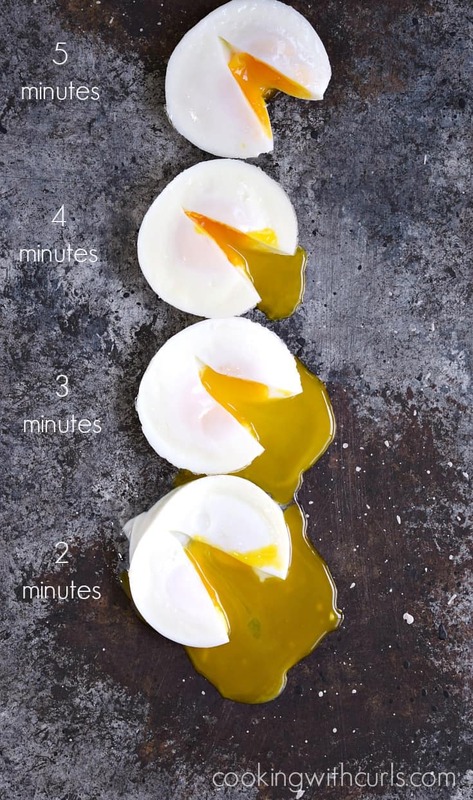 Crack each egg and pour it into the prepared cup….. 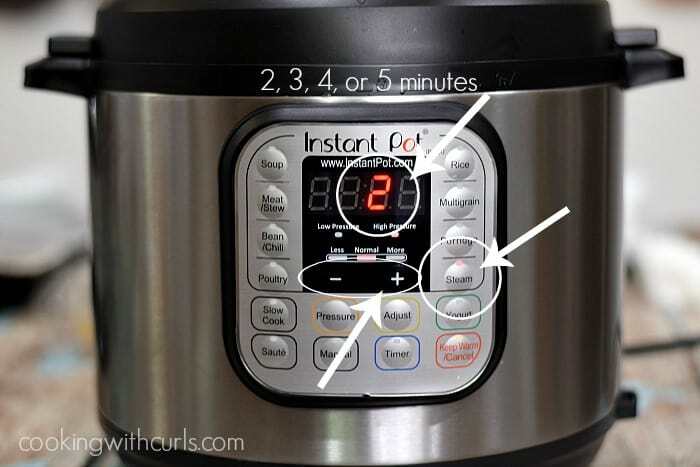 Very carefully place the silicone cups into the Instant Pot…..
Place the lid on the Instant Pot, twist to lock in place, and turn the knob to the Sealing position. Push the “Steam” button and adjust the time based on your desired doneness….. 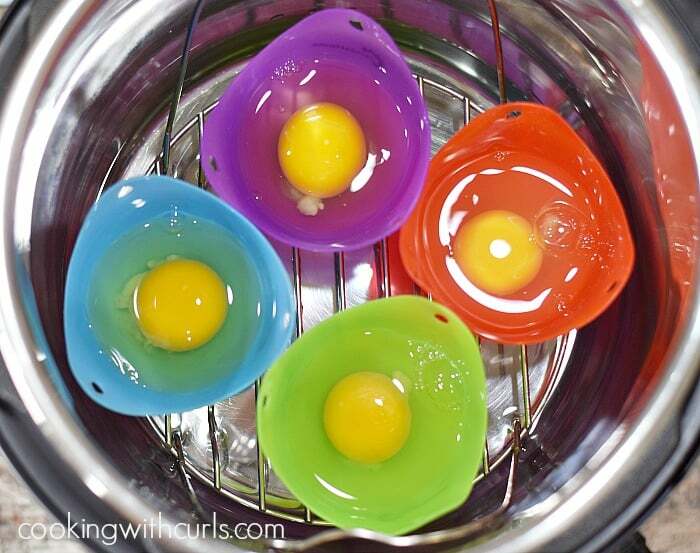 Very carefully remove the silicone cups from the liner…..
You may need to use a large spoon to break the seal between the egg and the silicone cup, but then they slide right out. Do Not use a knife!! 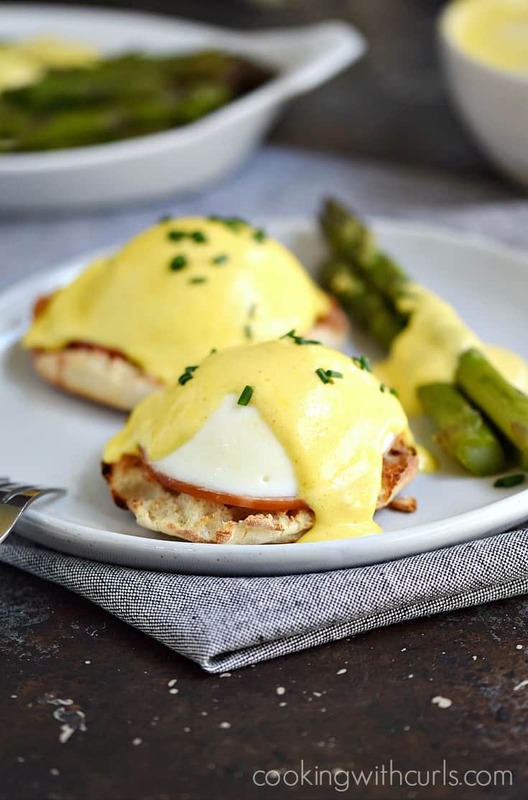 I used my Instant Pot Poached Eggs to make Classic Eggs Benedict…five times last week….so yummy!! *The steam has condensed on the lid and will drip onto your eggs. Twist the lid to unlock, then tilt to keep the water on the edge of the lid until you can position it over the edge of the liner or move it straight to the sink. 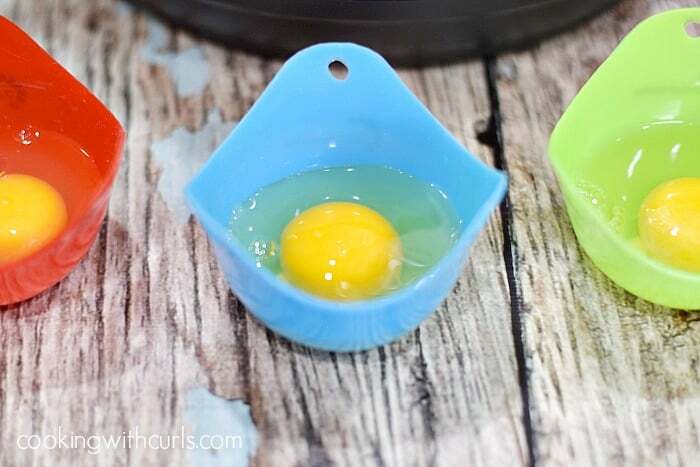 I experimented with Pam cooking spray, olive oil spray, grape seed oil spray, and ghee in these silicone egg cups. The eggs with the olive oil, would not come out of the cups without a fight…so that was a dud, as was the grape see oil. The Pam and the ghee worked the best, with minimal loosening around the edge with a large spoon. I did not try coconut oil because I am allergic to it, but I have heard that it works well. I cooked 4 eggs at once, and I also cooked them 1 at a time. 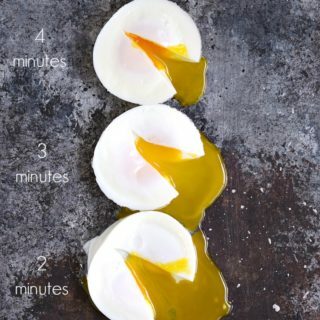 The cooking times are the same no matter how many eggs you put in the pressure cooker. 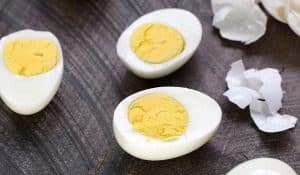 Are you are wondering why the 5 minute egg is runny but the Instant Pot Hard Boiled Eggs are are fully cooked in 5 minutes? It is because you release the pressure immediately with the poached eggs, but wait for 5 minutes with the hard boiled eggs. 😉 I know that at least one of you was about to ask that question. Now you can have Instant Pot Poached Eggs, hot and ready to serve in 2, 3, 4, or 5 minutes. They are super simple to make in individual silicone cups. Place the trivet in the bottom of the Instant Pot liner and pour in 1 cup of water. Spray each silicone cup with Pam cooking spray or rub with ghee. 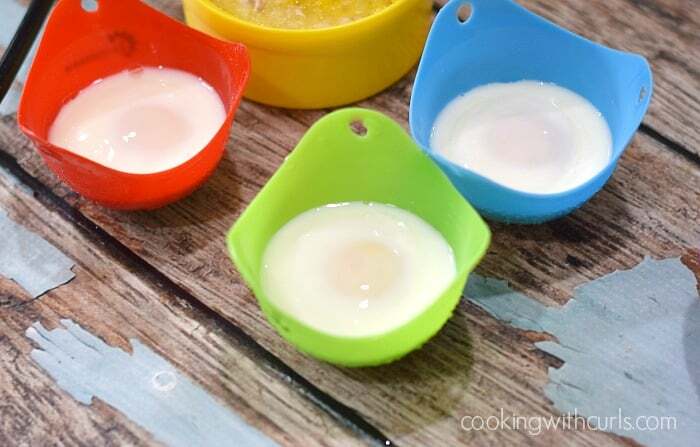 Crack each egg and pour it into the prepared cup. Very carefully place the silicone cups into the Instant Pot. Place the lid on the Instant Pot, twist to lock in place, and turn the knob to the Sealing position. Push the "Steam" button and adjust the time based on your desired doneness. Very carefully remove the silicone cups from the liner. You may need to use a large spoon to break the seal between the egg and the cup. 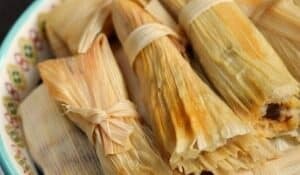 It is not necessary, it just gives them a cute shape and they pop out easily. I’ve been using custard cups(glass) and pressure with varying results. 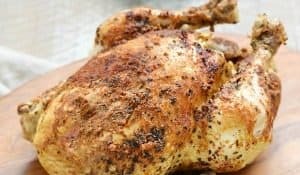 Also been using Pressure cook at 4 minutes. The release makes a difference. Will try the steam setting next time.